I loved this novel. Partly it’s thanks to the beautiful translation by George Miller, but obviously the original comes from Delphine de Vigan, the language sharp with pained interiority. My copy was a promotional ebook and despite the mistakes of formatting (so often the case with these early promotional releases) I knew when each character was speaking and heard their individual worries and concerns in tones particular to each. Loyalties is about a young boy, Théo, and the people around him. We hear his voice and those of his friend Mathis, his teacher Hélène, and Mathis’s mother Cécile. Unsurprisingly they are all struggling with divided loyalties. Théo’s parents are separated. They do not speak to each other. Théo spends alternate weeks with each parent, travelling on his own between the two homes. His mother is consumed by her anger for his father and refuses to even acknowledge Théo until he has put all his clothes in the wash and had a shower. His father is collapsing under a terrible depression that ties him to his bed and leaves him with a dirty flat, very little money and hardly any food. Théo protects him from his mother, his friends, anyone who might see the devastation and act accordingly. His escape from the weight of this responsibility and loyalty he feels to both parents, is alcohol. He hides with Mathis behind a cupboard in the school and drinks to ease his suffering. Hélène had her own problems as a child. She recognises something is wrong with Théo but struggles to get anyone to believe her or to help find out what is happening to him. Stepping beyond the boundaries of her role as teacher forces her to question what most deserves her loyalty: her profession or the child? Cécile worries for her son. She doesn’t want him associating with Théo, but she also has her own problems. She discovers something about her husband that puts her sacrifices for him in question and challenges her loyalties. Should her love and trust be towards her husband or her family, despite their lower social class and the lingering shame of her father’s own drinking problem (though he has long since been dead)? Then there is Mathis. He is afraid of his friend’s obsession with alcohol, but he is also afraid of disobeying his mother. Who most deserves his loyalty? The exploration of each character has beauty and depth, matching adult problems against the intensity of adolescent friendship to create a novel seething with rage against a society so keen to keep personal problems below the surface. Loyalties is a mesmerising novel that has all the philosophical and thematic delights of European fiction. Where are the English novels like this? If anyone can think of any, please let me know. 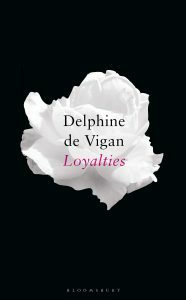 Loyalties makes me want to buy all of Delphine de Vigan’s previous work. If this sounds like your sort of novel, I’m sure you’ll feel the same way too. Out in January 2019, this is at the top of my list of recommended reads for next year. Next week I’m reading Eileen by Ottessa Moshfegh.